After three months of traveling to four different countries, my wife and I are back home. In January I was able to visit Egypt and fulfil the dream of a lifetime. For more than thirty years, I have been teaching about Egypt without having the opportunity of being at the many places I had read about in books and mentioned in the classroom. Being there and seeing those majestic monuments gave me a new perspective about the country and its history. Too bad that I was unable to visit Egypt while I was teaching. 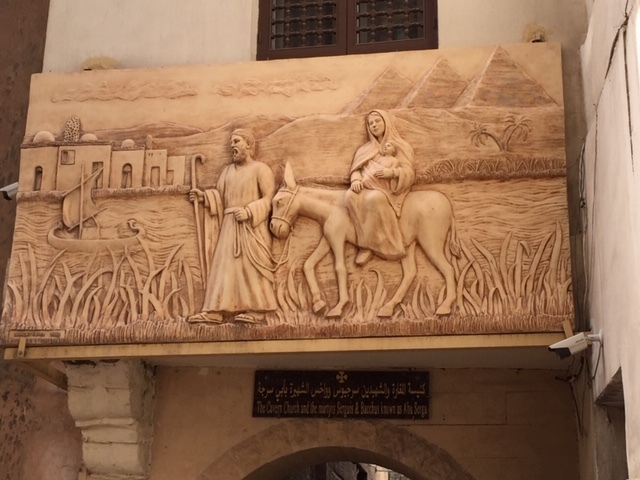 While we were in Egypt, my wife and I visited a Christian Church that, according to local tradition, was the place where Joseph, Mary, and Jesus stayed when they traveled to Egypt to escape from the hands of King Herod. The mural below is inside the church to indicate that this was the place where the holy family stayed. Then, in February my wife and I visited Vietnam, Thailand, and the Philippines. I lived through the days of the Vietnam war. I remember the protests in San Francisco and I was almost involved in one of the protests. I was in class, working on my Master’s degree in Berkeley, California the day President Richard Nixon bombed Haiphong Bay. Our class was cancelled and students voted to close the Bay Bridge in protest. I was not involved in the protest, but many of my classmates were. It was a difficult time in American history. Many of the soldiers who served in Vietnam were not welcomed home and many of them suffered for many years with the consequences of the war. On our flight to Vietnam, I met a Christian Vietnam veteran who was going to the Philippines to do missionary work. He was grateful that I recognized him as a Vietnam veteran. While I was in Vietnam, one of my guides was a man whose father fought in the Vietnam war. He told me that the war was an event of the past and the people of Vietnam want to live in peace and have a good relationship with the USA. Our visit to Thailand was very relaxing. We spent several days at a beach resort on Phi Phi Island. Someone has said that Phi Phi Island is one of the loveliest islands in Southeast Asia. From there we went to Phuket where my wife enjoyed visiting the elephant sanctuary and helping the workers at the sanctuary feed and bathe the elephants. My wife and I spent a week in the Philippines visiting one of our sons who lives there. Manila is a nice city where many of its citizens work for call centers for businesses located in the USA. When you call your bank, you are probably talking to someone in Manila. From Manila we went to Puerto Princesa and to the Subterranean River National Park on the island of Palawan. The Puerto Princesa Underground River winds through a cave and is navigable by boat for 2.7 miles. In March my wife and I spent three weeks in Florida. Our stay in Florida was more than just vacation. I spent most of the day doing research on a book I hope to complete by the end of the year. Beginning today, I hope to continue to blog on a regular basis. My first post will begin a series of studies on the character of God. The series will be based on God’s revelation of his character and nature to Moses on Mount Sinai. I hope you enjoy reading these posts.